Call Center Automation (CATI)-survey - Survox Inc.
Survox’s powerful CATI offering, provides call centers with a variety of tools to take more control over their operations, improve efficiencies and provide greater flexibility when it comes to designing, managing and reporting on the data collection process.  Combining Survox Phone with the Survox Dialer for predictive dialing, enhanced sample management controls make achieving quotas easier and more cost effective. The dashboard makes it easy to view real-time information about quotas and the status of current campaigns as well monitor interviewer productivity. IVR assisted workflows provide predictive outbound dialing and lets you capture and quickly route inbound calls to improve the respondent experience and fill quotas faster. IVR and inbound/outbound call blending increase call center efficiency. We consistently login over 250 interviewer stations from multiple phone centers onto one Survent study server and rarely have a hiccup. Also, the system lends itself to a high level of customization and integration.